An advice columnist for more than half a century, Ione Quinby Griggs (1891-1991) became a beloved Milwaukee icon. Famed in 1920s Chicago’s “Jazz Age” as a front-page “girl reporter,” her reportorial reputation came from coverage of women of lesser repute, “murderesses,” and mobsters’ molls of Chicago’s most notorious decade. 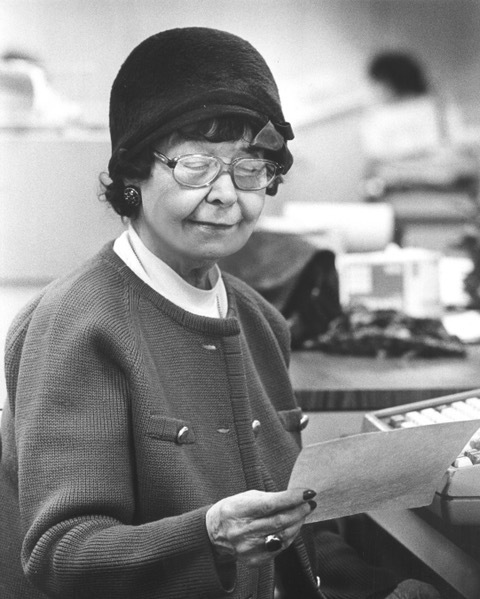 However, her reportorial range encompassed women entering politics, business, and other sectors of city life—until her newspaper folded during the Depression. Days later, she wed writer Bruce E. Griggs. A year later, after his sudden death, a “piecework” position—paid by “space rates”—at the Milwaukee Journal brought the jobless widow north. Instead, she established a “common sense” style and a format, emulated decades later by the likes of “Ann Landers” and “Dear Abby,” as “IQG” relied on readers, primarily women, to set the column’s agenda. Empowered by a collaborative role to write their page of the paper, readers made the back page of the “Green Sheet” the paper’s most popular page. It provided a community forum for issues deemed not front-page news by male editors, from Depression-era women’s unemployment to their World War II homefront workplaces to peace, prosperity (reflecting suburbanization of readership), “the Pill,” availability of abortion, and discussion of divorce laws that led to legislative reform. Griggs retired in 1985, an “advice industry” longevity record. ^ Genevieve G. McBride and Stephen R. Byers, “On the Front Page in the Jazz Age: Journalist Ione Quinby, Chicago’s Ageless ‘Girl Reporter,’” Journal of the Illinois State Historical Society 106, no. 1 (Spring 2013): 91-128. For her recollections of her reportorial years in Chicago and the city’s “bohemian writers’ circles,” see also Ione Quinby, “Vagabonds and Half-Baked Creeds,” in The Rise & Fall of the Dil Pickle: Jazz Age Chicago’s Wildest and Most Outrageously Creative Hobohemian Nightspot, ed. Franklin Rosemont (Chicago: Kerr, 2003), 134-35. For her book on the best-known “murderesses” among her many reportorial subjects, see Ione Quinby, Murder for Love (Chicago: Covici, Friede, 1931). ^ Genevieve G. McBride and Stephen R. Byers, ‘Dear Mrs. Griggs’: Women Readers Pour Out Their Hearts from the Heartland (Milwaukee: Marquette University Press, 2014), 63-64. ^ Ibid., 69-71, 74-77, 79-85. For her recollections of her career as an advice columnist, marking her fiftieth anniversary with the Milwaukee Journal, see Ione Quinby Griggs. “Dear Mrs. Griggs. . . ,” Once a Year (1984), box 11, folder 21, Milwaukee Press Club Records, University of Wisconsin-Milwaukee Archives, Golda Meir Library, Milwaukee, WI. ^ McBride and Byers, ‘Dear Mrs. Griggs,’ 75-76, 317. 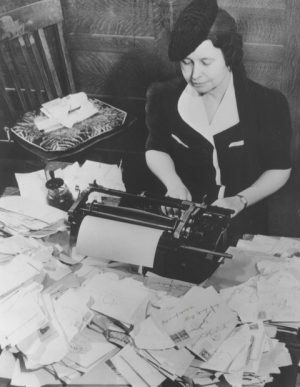 The column spanned fifty-one years, six days per week (but for her vacations), a total of more than fifteen thousand columns—some with dozens of letters, for as many as a hundred thousand letters by Milwaukeeans and readers across the state and region. Griggs, Ione Quinby. “Dear Mrs. Griggs. . . .” Once a Year (1984). Box 11, Folder 21, Milwaukee Press Club Records, University of Wisconsin-Milwaukee Archives, Golda Meir Library, Milwaukee. McBride, Genevieve G., and Stephen R. Byers. ‘Dear Mrs. Griggs’: Women Readers Pour Out Their Hearts from the Heartland. Milwaukee: Marquette University Press, 2014. McBride, Genevieve G., and Stephen R. Byers. “On the Front Page in the Jazz Age: Journalist Ione Quinby, Chicago’s Ageless ‘Girl Reporter.’” Journal of the Illinois State Historical Society 106, no. 1 (Spring 2013): 91-128. Quinby, Ione. Murder for Love. Chicago: Covici, Friede, 1931. Quinby, Ione. “Vagabonds and Half-Baked Creeds.” In The Rise & Fall of the Dil Pickle: Jazz Age Chicago’s Wildest and Most Outrageously Creative Hobohemian Nightspot, edited by Franklin Rosemont, 134-35. Chicago: Kerr, 2003.